Here at Bespoke Arcades we’re already well into our Christmas period and are getting busier each day! 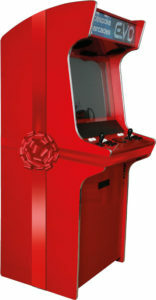 If looking for the perfect gift this Christmas and were thinking about one of our arcade cabinets then we will need to know as soon as possible to guarantee pre-Christmas delivery. We’ll do our best to accommodate orders right up until Thursday 20th December if in the London region or Wednesday 19th December if outside of London. If looking to order for Christmas and are based outside of the UK, please note that we’d need to have your order by Friday 14th December to get it to you in time for the holidays. Please call us asap to confirm if an overseas delivery is required as for popular destinations we may be able to extend into the week of the Monday 17th December. If interested in a custom colour finish for your BA cabinet then we would need your order confirmed by Sunday 9th December latest. Depending on the order we may not be able to guarantee delivery in time for the 25th so as ever it’s always best to get your order in asap if you can! If still unsure and want to come and try out our cabinets yourself, we welcome you to come and visit our Potters Bar showroom. Here you’ll have the chance to play on all of our cabinets and choose the perfect Christmas present for your friends, family or even yourself! Should you have any questions or need any assistance with a potential order please don’t hesitate to call us on +44 (0) 207 935 9005 or email us at [email protected].